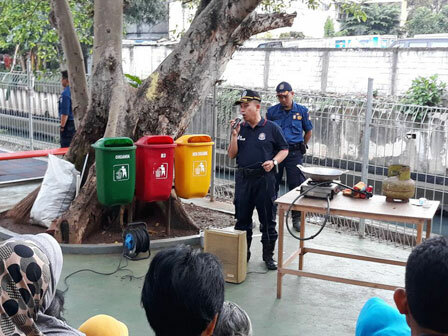 41 people of RW 03 Kampung Bali Urban Village get fire handling socialization today, Tuesday (2/27).
" Besides theoretically, residents also practice directly how to handle and put out the flames"
Ahmad Sanjoyo, Head of Tanah Abang Sector II, Central Jakarta Fire and Rescue Sub-dept. expressed fire socialization is held at Haji Hasbi RPTRA. "Besides theoretically, residents also practice directly how to handle and put out the flames," he stated, Tuesday (2/27). In the meantime, one of locals, Siti (39) admitted, it is very useful for her. "Initially we were a little scared, and panicked but after being calmed and explained, we become brave. The point is not to panic," she said.